Page stats are for the one-way segment. Description below is for a Serrano - Sycamore Shuttle. This is a one way hike best done by shuttling one car at one end and another car at the other end of the hike. The hike starts at the dead end of Serrano Canyon Rd and travels into an old ranch site above Serrano Canyon and Big Sycamore Canyon. The trail then drops into Serrano Canyon where there is a nice seasonal creek and fairly lush vegetation for the area. The canyon exits into Big Sycamore Canyon where you'll follow the trail down to Sycamore Beach. After crossing the gate at the end of Serrano Canyon Road, the trail meanders for about a half mile downhill before reaching a plateau. Here is where the remains of a ranch house can be found as well as a number of old relic farming implements. This is a great place to explore. As you visit other parts of the plateau you’ll find other farming implement and water tanks. A trail heads uphill to the north to another plateau that affords a view of the ocean. You’re only a couple miles from the ocean, but there are hills in the way. So to see it you need to find higher ground. Eventually, you’ll find your way down into Serrano Canyon. As you descend toward Serrano Creek the vegetation becomes lusher. There are lots of trees, flowers and…. Poison oak. I recommend bringing a bottle of Tecnu for this hike because you will brush against poison oak. It’s unavoidable – the price you pay for such an otherwise cool hike. Toward the end of Serrano Canyon, the trail passes some pretty interesting geology including some folds and a pretty massive landslide. Shortly afterward the trail exists to the Big Sycamore Canyon Trail. It’s a mile or so down Big Sycamore Canyon Trail to reach Big Sycamore Campground. 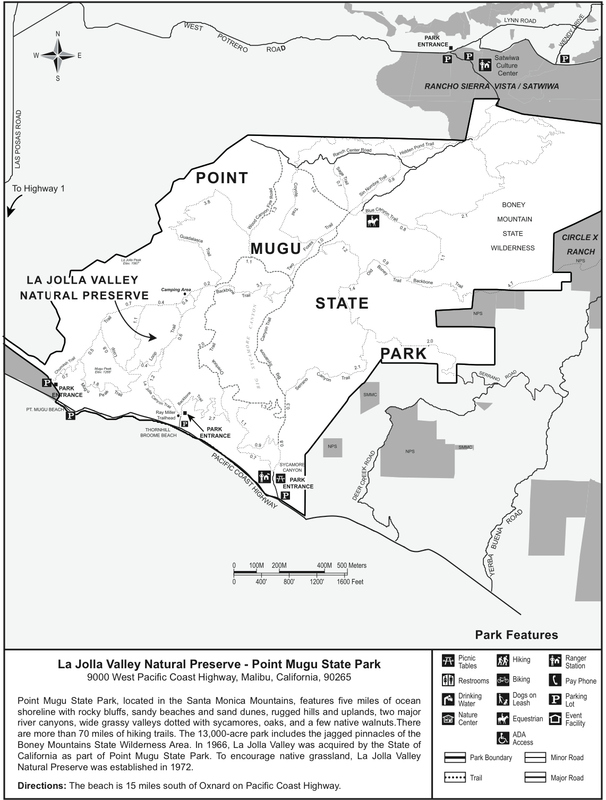 You’ll need to pass through the campground to reach PCH or the campground parking lot (if you decided to pay to park rather than the free option. If you start out of Sycamore Beach/Campground, take Pacific Coast Highway to Sycamore Beach/Campground and head up the Canyon. To start from Serrano Canyon Road, take PCH to Deer Creek Road. Dear Creek Road becomes Pacific View Road. Turn left onto Serrano Canyon Road and follow the road to the end. The trail begins on the other side of the gate.